Giving thanks is one of those situations where it’s sometimes difficult. I am not saying that people are a bunch of rude heathens who don’t care about each other, even though that is what happens on occasion. I’m simply saying that giving thanks isn’t always the easiest thing to sort out. If you’re like me, the list of things you have to be grateful for is long, filled with the names of a lot of people – I am, above all, grateful for people more than things – that deserve my gratitude most, if not all, of the year. I’m super lucky to have friends I can call on, rely on, spend hours chatting with when there’s time, and that’s just the beginning of my list. Thanksgiving is the perfect way to ease into the holiday season. As we plunge headlong into the season, we often seem to turn the holidays into a seriously stressful time that doesn’t turn out to be a whole lot of fun. Bummer. I usually make a stab at decorating my house, but the actual amount of decorating that occurs is directly proportional to the number of guests we’ll be having over the Christmas to New Years time frame. I love cooking – everything except the baking – and I always delight in cooking something slightly off kilter for Thanksgiving – if everyone else has a turkey, I cook pheasant, quail, duck – something that is more in line with what the Pilgrims were actually able to eat. On the days that I have to, I do a mean turkey, really beautiful, stuffed under the skin with sage and orange peel, and a roasted golden and crispy texture to the skin. I should be giving thanks that I can and do cook as much and as well as I do. Roasted root vegetables are among my favorite side dishes, as well as being immensely popular with guests when they’re served. They are simple, easy to cook, easy to store, and you can use the leftovers in a multitude of ways the next day — mashes, additions to soup, flavors for stock, or frozen to be reheated again later. The basics of root vegetables are the same as any other vegetable — the quality of the finished product is always directly proportionate to the quality of the raw materials. Farmers’ markets are an excellent way to purchase root vegetables in season, and to obtain the most flavorful products. The real bounty of root vegetables is in the fall and winter, when tomatoes, corn, etc are either scarce or hothouse grown and expensive. Root vegetables also pair well with other fall foods like the many varieties of squash available at the market during the fall. When storing root vegetables, trim the tops and either prepare as greens, use in stock preparation or discard — if the tops are left on the roots, they will continue to feed on the moisture in the roots and you will wind up with soft, lumpy and inedible roots. Beets, turnips, celery root, and parsnips are favorites when I cook; this may be more about the availability of them as ingredients, but I also really appreciate using some of the less loved veggies as the star of my show. The easiest way to cook root vegetables is roasting, preferably at a high temperature. The most important element is to prep all the pieces the same size and general shape so the cooking is even throughout the dish. The second most important element is have a dish the correct size — crowding the pan will create uneven cooking, with some bits cooked to a crisp and some so hard they’re nearly raw, which certainly detracts from the finished product. Sheet pan cooking, which has been gaining in popularity during the past few years, is good for most root vegetables – just keep in mind that the lower sides of a sheet pan mean the veg will roast faster than if they are in a pan with higher sides. And if you are lucky enough to have convection in your oven, that will also shorten the cooking time. The age of the ingredients also plays a role in how long it takes to cook — baby vegetables cook a lot more quickly than older, larger ones, even at the same temperature and cut size. How do you plan to serve the finished dish? Family style, plated, buffet — this plays a part in how it will be presented; good plate composition always lends itself to a satisfying meal. I normally quarter (or halve) my root vegetables, and I try to leave a small bit of top — one-quarter to one-half inch — on for interest. I also peel prior to roasting, I have a nifty three way peeler that gets it done quickly and efficiently. Peeling beforehand allows for blemishes, bruises or dark spots to be cut out, lessening the chance of an entire tuber being ruined during the cooking process. I toss the prepped pieces lightly with olive oil or avocado oil, both take the heat without difficulty and are neutral in taste, and add a bit of grey salt or kosher salt, and pop them in the oven to roast. Lightly spraying the pan with non-stick cooking spray makes for very easy cleanup as well. A minimum of 350 degrees is required to roast, but depending on how quickly or how crispy outside, I prefer to use either 400 or 425 degrees. It’s key to check for doneness often, and occasionally take a wooden spoon and give the vegetables a mix through the pan to insure even cooking. Small pieces, and baby vegetables, will cook in as little as 15-20 minutes — especially carrots, while others, such as quartered beets will take closer to a half hour at 400 degrees. Again, times will be reduced if you have convection in your oven – and if you do, be sure to use it! Finishing the vegetables after they’re done cooking is where the difference comes in, at least in my kitchen. The wonderful variety of flavored oils, salts, herbs, and spices that are available offer the chance to turn a simple, basic foodstuff into something outstanding. It takes only a small amount of the finish to add a spark to the dish; be VERY careful not to drown the vegetables. You are dressing the food, not marinating it, so less is more! Toss gently to coat, and serve hot. Quick tip: keep the vegetables separated in the roasting pan and you can use a couple of different finishing oils/seasonings combinations at the same meal! 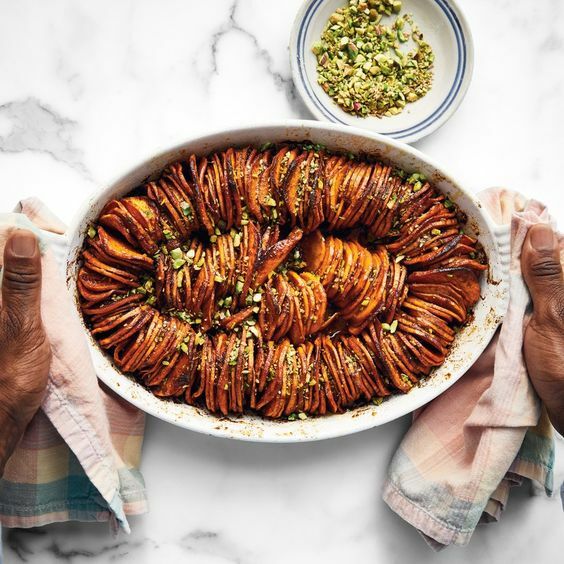 I hope you’ll decide that a side dish of roasted root vegetables is THE way to go this year for the holidays!